Stray Rescue's Randy Grim holds up a picture of a tortured dog. At left, St. Louis Mayor Francis Slay and at right, Officer Louis Naes. The recent high-profile case of Darick Stallworth, who pleaded guilty last month to torturing and killing five dogs inside a vacant building, is an extreme example of the kind of crime the new task force will address. The police department says the task force officer will work closely with Stray Rescue and the Humane Society to follow up on tips and investigate cases. 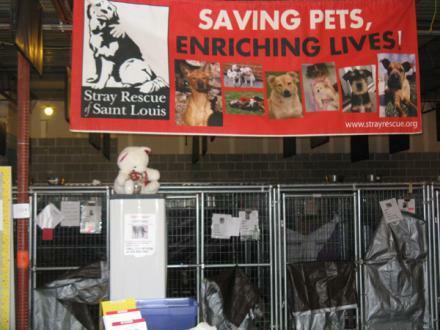 Randy Grim, the founder of Stray Rescue called the announcement a “dream come true." Grim noted that people who commit crimes against animals usually commit crimes against people as well. A special docket for animal cruelty cases will also be created in the municipal court system.